After sending an email, you will be prompted with a dialogue box with various options. These are some of the things you may want to do immediately after sending an email. After sending an email, you may want to immediately create a follow up task, such as a task assigned to a team member to follow up on the email with a call. 1. 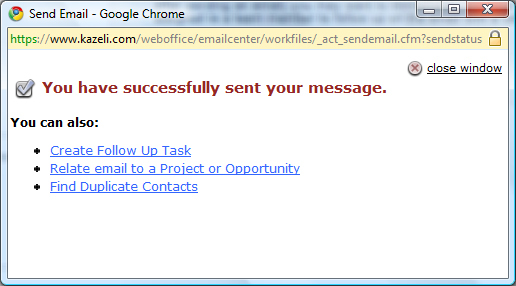 From the Send Email dialogue box, click CREATE FOLLOW UP TASK. 2. 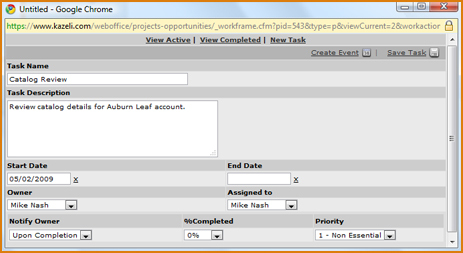 Click on the name of the Project or Opportunity to which the task will belong. 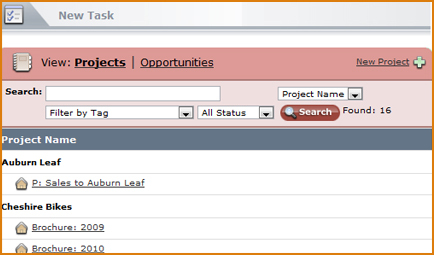 You can switch between Project and Opportunities by using the VIEWS tabs at the top. You can create a new Project or Opportunity by clickingNEW PROJECT or NEW OPPORTUNITY (top right). 3. Fill out the task information. 4. The task will now appear in the list of active tasks. You can now close the window.